"Jacques* was invited to Benvenuto, where he met Mackenzie's youngest daughter, twenty-two-year-old Grace, five years his junior. 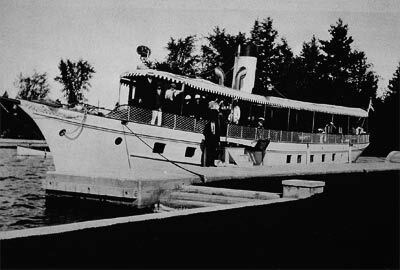 The tall, dark and handsome aviator was invited to tour the Trent Canal on the Mackenzies' magnificent yacht, the Wawinet, which Sir William had purchased in 1903 from the Polson Iron Works in Toronto. When it reached the locks at Fenelon Falls, the local folk hitched up their horses and buggies to catch a glimpse of the yacht and its famous passenger. Local gossip had it that the tour was laid on to catch a count. If so, it worked." *Jacques de Lesseps, son of Ferdinand de Lesseps of Suez and Panama Canals fame. When it sank on September 21, 1942, the Wawinet was owned and operated by Bert Corbeau, well known hockey player of the 1930s who had purchased it in 1938. It was a tragic accident, only 17 of the 42 passengers surviving. Read an interesting description on the tragedy by Kevin van Steendelaar. The Wawinet is now a site for amateur scuba divers, and is listed in the Ship Information Database of the Canadian Heritage online Reference Library.